After the battle with Doakuder at Soukaizan (the "other" world where the rainbow has disappeared because of the devils), a demon world Devil came to Genseikai (human world) and stole Wataru's conscience. Because of that, Wataru's heart of justice and his memories of being Kyuuseishu (world savior) vanished. After Shibaraku and Himiko brought him back to Shinbukai (the "other" world, where Soukaizan is located), Wataru regained his memories, however his conscience was still missing. To get it back, Kyuuseishu Wataru must return to fight the devils, rescuing all of Soukaizan from catastrophe! 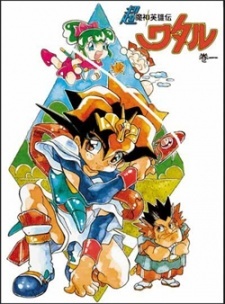 Chou Mashin Eiyuuden Wataru is the 3rd work of the Mashin Eiyuuden Wataru TV series by SUNRISE, and is considered as a "remake" series of the previous Wataru series. It started airing from October 2, 1997, and ended on September 24, 1998, every Thursday from 6:00 to 6:30pm, with a total of 51 episodes. Watch Chou Mashin Eiyuuden Wataru Episodes Online at Animegg.org. Chou Mashin Eiyuuden Wataru is available in High Definition only through Animegg.org. Choose an episode below and start watching Chou Mashin Eiyuuden Wataru in Subbed & Dubbed HD now.